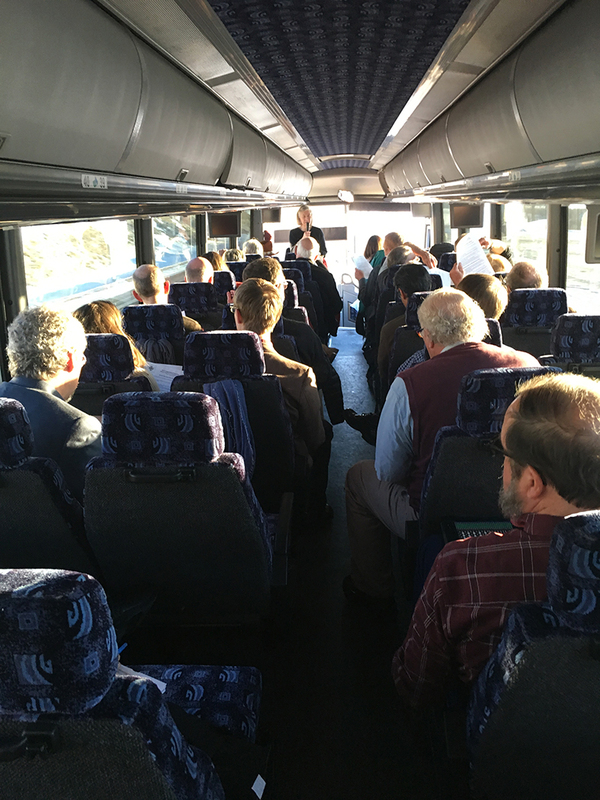 On Monday, January 23, we had a great day at the Capitol with the Montana Association of Christians (MAC). We're honored by their invitation to join them in Helena and their dedication to social justice issues including the humane treatment of Immigrants and Refugees. Reflecting back, I am reminded that MAC was one of the very first organizations to step up in support of Soft Landing Missoula's (SLM) mission, to bring refugee resettlement to Missoula, with a statewide letter that was drafted in late 2015. Thank you MAC for all of your past and continued support. Full bus on the way to MAC Day in Helena. As a little recap, we boarded buses in the first light of the morning with very generous local donations of coffee (City Brew) and treats (Orange Street Food Farm, Krispy Kreme, and Bagels on Broadway) and headed on our way. The bus was a buzz with talk for the day and soon we got to hear from MAC a rundown on all 4 of their focus areas: abolition of the death penalty, support of prison re-entry programs, increased child mental health services, and the humane treatment of refugees and immigrants. SLM added a few words on the refugee piece and before we knew it, we were gathered in Helena! This was my first time in the Capitol Building and first experience in seeing first hand how Montana's laws are made. I have to say, it was pretty neat. The building itself is so beautiful and powerful- the art and paintings stunning and of course I loved the statue of Jeanette Rankin! First thing we did was have a chance to meet many of our legislators from around the state at the luncheon in the Rotunda put on b MAC. There were tables for different cities/regions of Montana and Legislators were invited to sit down with their constituents and chat about these issues. There was of course plenty of co-mingling as well and I feel fortunate to have also gotten the chance to chat with legislators from Flathead and Ravalli counties as well. We are so so thankful the Legislators took time out of their packed days to join us and listen to our concerns! Thank you Montana Legislators for all of your hard work! After the luncheon we had a chance to go sit in the gallery while in session. We visited the House first where MAC received a very warm welcome and SLM also got introduced by Missoula Representative Andrea Olsen. View from the gallery of the House. We followed this up with a visit to the Senate gallery and I watched hearings and voting for the first time. This was really a great introduction to what it might look like if we get put in the position of having to testify and show up for any of the anti-resettlement bills in draft. We then rallied back home on the bus with plenty of fabulous conversation from the day's events! As a final recap, I will just say that there are no anti-resettlement bills out of draft. There are a few in the hopper, but nothing has hit the floor yet. We will be sure to keep everyone up to date on this as well as we can. If and when this happens, will be calling on each and everyone of you to join us in Helena or make calls and write letters to show your support of the refugee program that Missoula has built. Thanks again MAC for such a wonderful experience!